The Iglesia Luterana Sínodo de Nicaragua (ILSN) has developed an interesting method to help seminary candidates prepare for their theological studies. During one year or more before they start the program, the lectores (seminary candidates) are involved in congregational and mission outreach activities. They assist their pastors as readers, conduct lay-led worship services, visit homes, participate in missionary programs and other activities. Seventeen lectores or candidates considering the pastoral ministry studied with Rev. Leonardo Neitzel. Currently, there are seventeen lectores or candidates considering the pastoral ministry in the ILSN. They come from several congregations and backgrounds and gather for special seminars at the mission centre whenever arranged by the Synod. Recently they had two special seminars: basic introduction to the study of Scriptures, liturgy and preaching, presented by Rev. Dr. Ralph Mayan and basic introduction to the study of theology (propaedeutics), which I taught. The previous source for funding the seminary program is not currently available due to economic conditions. So LCC and the ILSN are asking the Lord God to encourage His people to provide financial resources to start the third seminary program with these candidates in 2012. The regular seminary program normally has four intensive courses taught yearly during two years, plus the practical activities of students and the continuing education which follows. We pray and trust that the Lord will provide the means for this to happen as He is growing His church in Nicaragua and other countries in Central America, and as the ILSN is beginning to see a shortage of church workers. The Saviour Jesus Christ teaches us when He says, “The harvest is plentiful but the workers are few. Ask the Lord of the harvest, therefore, to send out workers into his harvest field” (Matthew 9:37-38). And He Himself as the true God has not left His church without His promises as He says, “I will give you shepherds after my own heart, who will lead you with knowledge and understanding” (Jeremiah 3:15). Although it is ‘winter’ in Nicaragua, temperatures are around 30 degrees Celsius with lots of thunderstorms, lightening and heavy rain at the end of every day. And then there are mosquitoes, which are very annoying! I am finishing my second week in Nicaragua teaching intensive courses in the Continuing Education Program for pastors and deaconesses of the Iglesia Luterana Sínodo de Nicaragua (ILSN). The courses are hermeneutics, (principles of Bible interpretation) and Preparing the Congregation in Mission. I have visited LCC mission fields in the area and met with the Synod’s leaders and Evangelism committee. The synod established its two-year mission strategies, and under God’s grace and with the help of the Holy Spirit they want to add 100 new members to each congregation during this period. The Apostle Peter recommends, “But grow in the grace and knowledge of our Lord and Saviour Jesus Christ. To Him be glory both now and forever! Amen” (2 Peter 3:18). The church workers’ main focus here is studying and sharing the Word of God through their daily activities. It has been a blessing to see them applying the Word of God in very special situations, especially in the Children’s Education Program. My wife, Maria is with me. She is a social worker and family therapist. As a volunteer she is using her gifts and experiences especially with pastors’ wives and deaconesses who with her for a very special moment of sharing about their burdens, challenges, blessings and joys in the work of the Lord’s kingdom. The theme of the study was “A Christian woman by God’s grace”. This study continued the type of work Dr. Ralph and Linda Mayan have provided in this area. There is a great need for spiritual and emotional support to pastors, deaconesses and their families. We pray and trust that the Lord will continue to provide the financial means needed to carry on such a program. 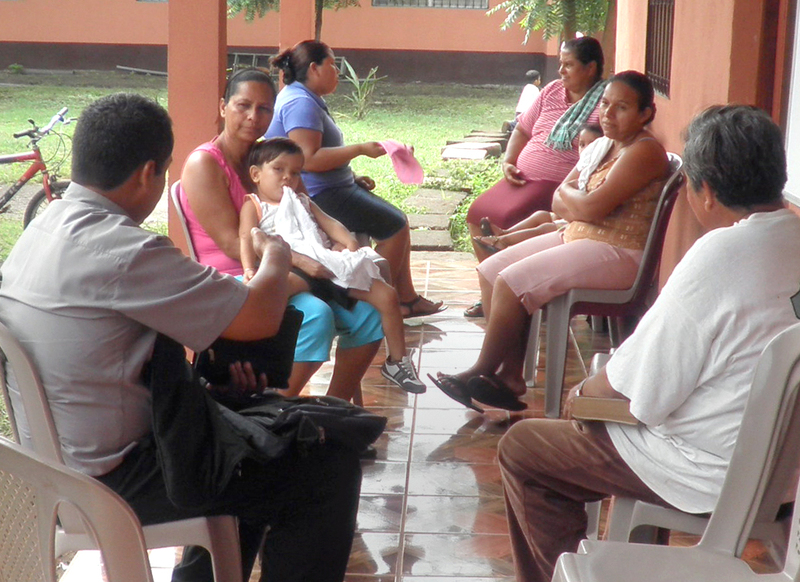 Since its beginning, the medical clinic of Iglesia Luterana Sínodo de Nicaragua (ILSN) has provided a special opportunity for the church to care for the peoples’ physical needs as well as for Gospel witness. I have met former patients and heard stories of people who came to the clinic, who besides the medical treatment received God’s Word, a prayer and were comforted in their anxieties by the ministration of the love of Jesus Christ as Saviour. A beautiful example is from Anastacio Cerda Ortiz. He came for medical treatment and was approached with God’s Word by the president of the ILSN. He became interested in the work of the Lutheran church and today is a faithful member of the church, present every Thursday at the Clinic to build friendly relationships with patients, to pray for them if needed and to share the Gospel with them. He is also involved in the church work and has his own business during his spare time selling bread on the streets.
. . . First, social activity is a consequence of evangelism. That is, evangelism is the means by which God brings people to new birth, and their new life manifests itself in the service of others. Secondly, social activity can be a bridge to evangelism. It can break down prejudice and suspicion, open closed doors, and gain a hearing for the Gospel. Jesus sometimes performed works of mercy before proclaiming the Good News of the Kingdom. Thirdly, social activity not only follows evangelism as its consequence and aim, and precedes it as its bridge, but also accompanies it as its partner. They are like the two blades of a pair of scissors or the two wings of a bird. This partnership is clearly seen in the public ministry of Jesus, who not only preached the Gospel but fed the hungry and healed the sick. In his ministry, kerigma (proclamation) and diakonia (service) went hand in hand. His works explained his words, and his works dramatized his words. (Soritua Nababan, “Your Kingdom Come”, pp. 179-192 Lausanne Grand Rapids Consultation, June 19-25, 1982). As God’s church we “unlike so many, [we] do not peddle the Word of God for profit. On the contrary, in Christ we speak before God with sincerity, like men sent from God” (2 Corinthians 2:17). As we serve we don’t do it for earthly reward or profit. As we serve others we rejoice in the opportunities to share the forgiveness and salvation Jesus provides for all people. We don’t serve for own sake but for the Gospel of Jesus Christ. Our greatest joy and reward will be at the very end of the ages when we will see those whom we have served joining us for eternal life. It will be our reward of grace when Jesus will say to us: “Well done, good and faithful servant! You have been faithful with a few things; I will put you in charge of many things. Come and share your master’s happiness!’” Matthew 25:23. Jesus will say to his own at the very end “I tell you the truth, whatever you did for one of the least of these brothers of mine, you did for me.” Matthew 25:40. 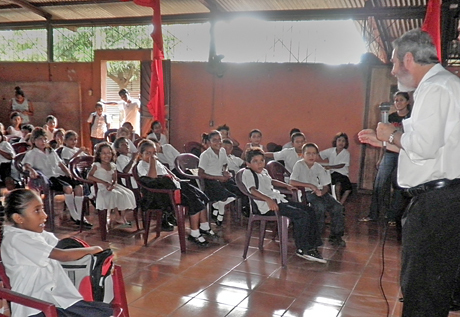 We have been impressed with the way pastors, missionaries, deaconesses and “maestras” daily carry out the church’s mission and ministry in Nicaragua with children. The foundation of the work is the Holy Scripture. Besides tutoring and reinforcing lessons in math and Spanish and assisting them daily with homework assignments, they teach and lead the children in God’s Word as they provide exercises through Bible stories and memorization of verses. Martin Luther’s Small Catechism is the next important tool in their teaching. In the community of Santa Patricia we had the privilege of spending time interacting with more than 100 children and workers communicating through our “Portuñol” (a mix of Portuguese and Español) – and what a blessing it was to hear them recite Scripture verses, parts of the Small Catechism, pray the Lord’s Prayer and sing. The way the church leaders and the community value these important ‘tools’ and handle them interactively with the children is a great reason for our gratitude to our Lord and Saviour Jesus Christ. This Christian education process, seen in church and in family circles at home, highlights one of Martin Luther’s educational methods throughout his entire ministry and in his own family. Is the Lord trying to teach us a lesson today as we sometimes seem to put aside the Holy Scriptures and the Small Catechism in favour of other earthly priorities? You are currently browsing the LCC On the Road blog archives for June, 2010.